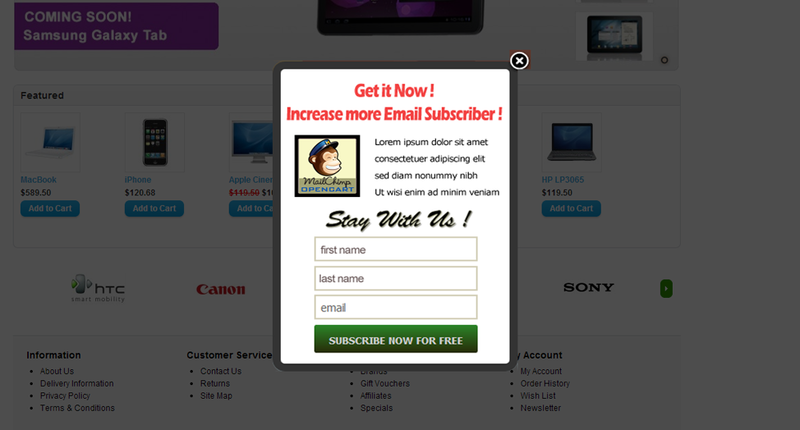 “MailChimp Subscription with Custom Popup for OpenCart” is an amazing email subscriber module which allows the site Admin to create Custom Popup, place YouTube/Vimeo embed videos, image or any sort of HTML/custom content in the subscription popup and the Visitors can Subscribe their email to the MailChimp subscription list. It is flexible, best and simple way to subscribe email for newsletter. Admin can set “MailChimp Subscription with Custom Popup for OpenCart” module through a Popup style which has various display options or can add this as a Button (Menu). If you want convert the visitors to your member /subscribers then the Custom Popup is the best solution to tell the users why they should subscribe or to show them a new advertisement or Banner on the popup to allure them get subscribed. If you want your website to reach every reader, you have to use email and “MailChimp Subscription with Custom Popup for OpenCart” module will be useful to promote your company to the general people. “MailChimp Subscription with Custom Popup for OpenCart” module is very useful for those people who need to send Newsletters to users. This powerful module allows users to collect and manage emails & newsletters with an easy way. “MailChimp Subscription with Custom Popup for OpenCart” module has some excellent features and very easy to setup. “MailChimp Subscription with Custom Popup for OpenCart” module is more flexible and compatible with many existing modules in the OpenCart repository. This Module is fully customizable. 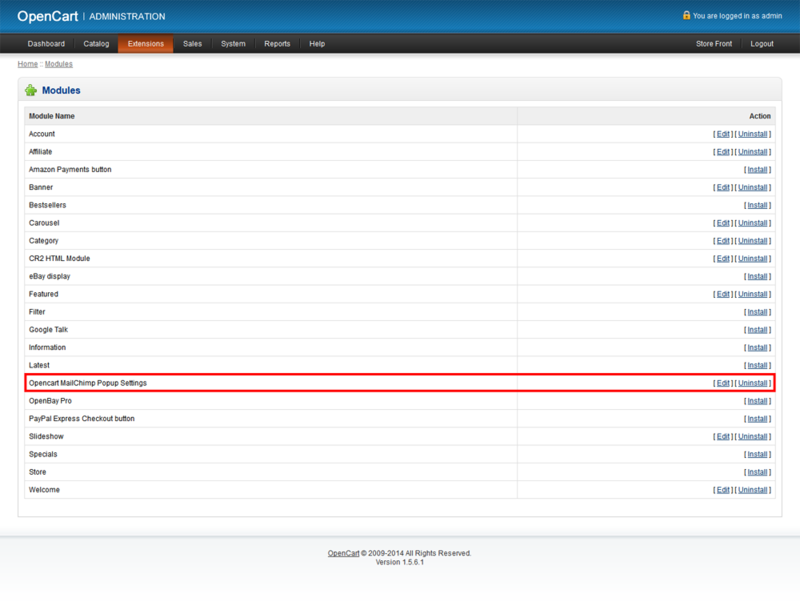 Users can easily configure the module into the new or existing OpenCart websites. User can show the subscription form into the Popup and/or User can add this as a Button (Menu). User can design the custom popup according to his website template using html editor. User can place YouTube/Vimeo embed videos, image or any sort of HTML/custom content in the subscription popup. Separate HTML editor for mobile device. MailChimp Cookie Expire Time can be set from Admin. 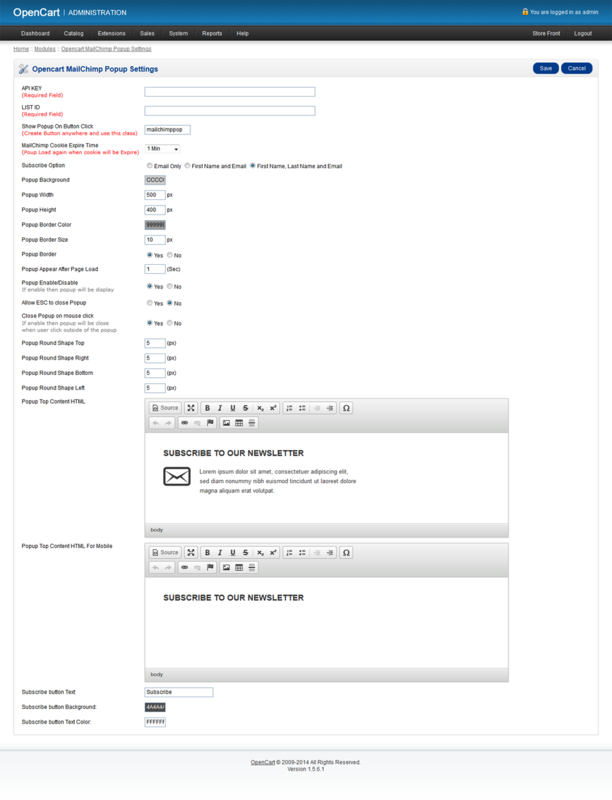 Three types of Subscription Options (Email Only, First Name & Email and First Name, Last Name & Email). Popup Width, Height, Background color, Popup Border, Popup Border Color, Border Size, can be set from Admin. “Popup Appear after Page Load” time can be set. Admin can Enable/Disable the popup. Option to Allow/Disallow ESC button to close Popup. Option to Close Popup on mouse click. Option to make the Popup Round Shape. Subscription Button Text, Button Background and Button Text Color can be customized. User can create a Button or Link on his website, just insert the button class “mailchimppop” and press the button and MailChimp popup will appear. Responsive Popup for mobile or other devices. It has option to send email newsletter to registered user.